The key Local ID goal for the 2014 Cycle, as jointly proposed and validated by the participants, was to actually apply to real life the 'Business Guidance for Full Protection of Children and Adolescents in the Context of Large Projects', elaborated by the member companies in 2013, along with FGV Law School in Sao Paulo and with Childhood Brazil. Based on a strategic map for shared value generation - comprising both strategic and specific goals -, Local ID team supported each member company in the deployment of a pilot, determining a specific action plan according to their reality. During the meeting, we had the presence of experts on the main topics covered by the initiative throughout the year. Rita Ippolito, Childhood Brazil's C-A Human Rights expert, showed figures reflecting the reality of children and adolescents' abuse and sexual exploitation in the context of large projects deployed all over Brazil. Such overview was important in order to lay the foundation for Cenise Monte Vicente’s presentation, on experiences of internalization of the human rights topic in organizations. Ms. Vicente highlighted the role organizations play in the fight against exploitation, abuse or any kind of violation of C-A rights that might somehow be connected to business operations. To wrap up the meeting, EAESP/FGV Professor, Antonieta E. M. de Oliveira, an expert in the use of BSC (Balanced Scorecard) management tool, presented significant concepts to empower participants on the use of the tool and, therefore, autonomously start building their own BSC aiming at fully protecting C-A. At her presentation, Professor Antonieta defined concepts and made important suggestions for filling out, managing and formulating the BSC. 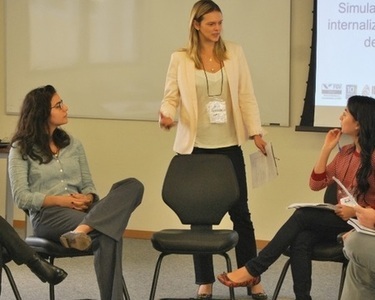 Professor Flavia Scabin, from the Research Group on Human Rights and Companies, at FGV Law School, Sao Paulo, participated in this WG. She talked about the legal responsibilities organizations have to fully protect children and adolescents (C-A), and mentioned cases and legal opinions in which organizations were held accountable and indicted for violating the Brazilian Statute of the Child and Adolescent (ECA) and the set of rules that govern the relationship between the society, families and the State with those groups. Additionally, international initiatives that rule on the topic of human rights and companies were also presented, a trend that asks for attention in the Brazilian business sector. According to the participants, the strength of the presentation was a clear and straightforward explanation on a number of legal responsibilities organizations are subject to when it comes to C-A rights protection. Also, the cases presented showed the participants that including this topic in business management cannot be considered a minor issue, a voluntary action, or else something that can be considered in isolation by sustainability sectors within the organizations. During the meeting, each member company had the chance to present the context they chose to apply their BSC aimed at full protection of children and adolescents, as well as their challenges and the lessons learnt in the beginning of that exercise. Member companies were invited to present to all participants their BSC elaboration status aimed at full protection of children and adolescents (C-A). Thus, participants could share their doubts, dilemmas and lessons learnt during the elaboration of their own BSC, the kind of experience that only a hands-on process is able to offer. Besides powerful exchange of experiences in a conversation roundtable, individual presentations served as references for EAESP/FGV Professor, Antonieta E. M. de Oliveira, expert on BSC management tool, to advise each organization in the process of building their own BSC. This was useful for organizations to adjust their BSC content (strategic goals, specific goals, indicators and action plans), thus improving the chances the tool will be efficient and successful. During the meeting, participants could validate the content of the publication entitled 'Implementation Guide of Business Guidance for Full Protection of Children and Adolescents in the Context of Large Projects', expected to be launched in March 2015. The last Local ID WG had a productive conversation roundtable involving all participants. They decided the next steps to keep the topic in member companies' agendas and, also, proposed ideas for inter-sector mobilization in order to spread the knowledge produced during the two years of the initiative. The participants will get together during the launching of the publication entitled ‘Implementation Guide of Business Guidance for Full Protection of Children and Adolescents in the Context of Large Projects’, expected to take place in March 2015. The Guide will cover many relevant aspects for building a BSC aimed at full protection of C-A and for internalizing the topic within organizations. One of the chapters, for instance, will provide step-by-step instructions on how to elaborate a BSC; the publication will point legal trends in holding organizations accountable for respecting children and adolescents rights at the national and international levels and, also, will show the testimonials of organizations who built their own BSC aimed at full protection of C-A, the methodologies used, the lessons learnt, challenges and targets related to the topic.